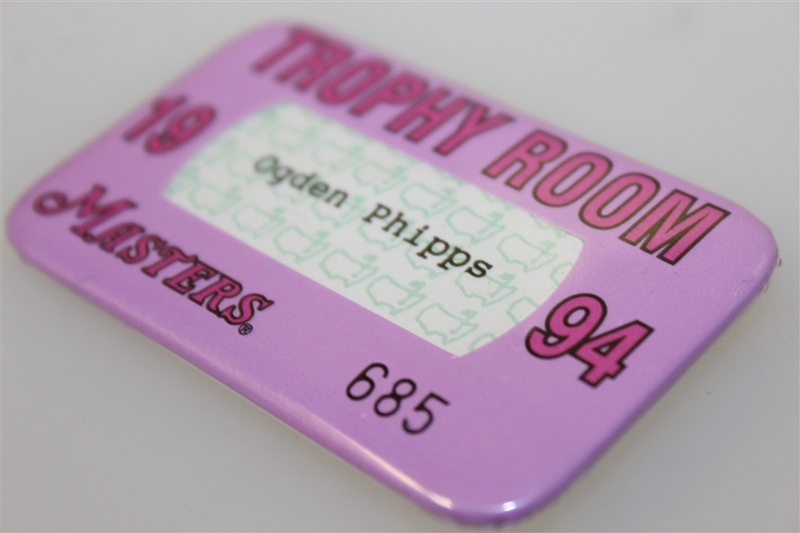 Offered here is trophy room badge #685 from Ray Floyd's collection from the 1994 Masters Tournament. 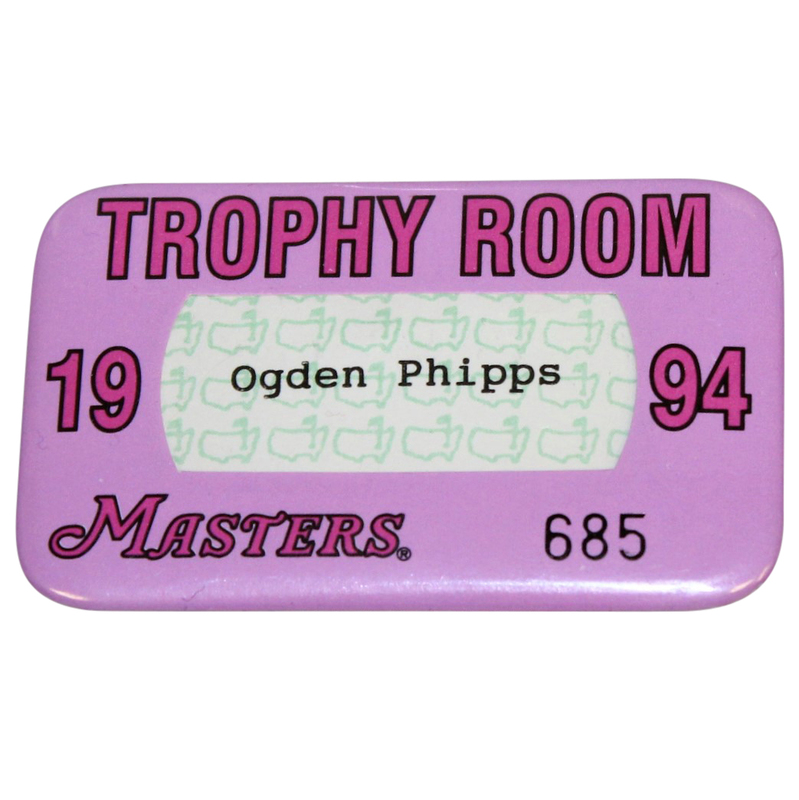 This badge reads the name Ogden Phipps, the legendary tennis player and horse racing executive. 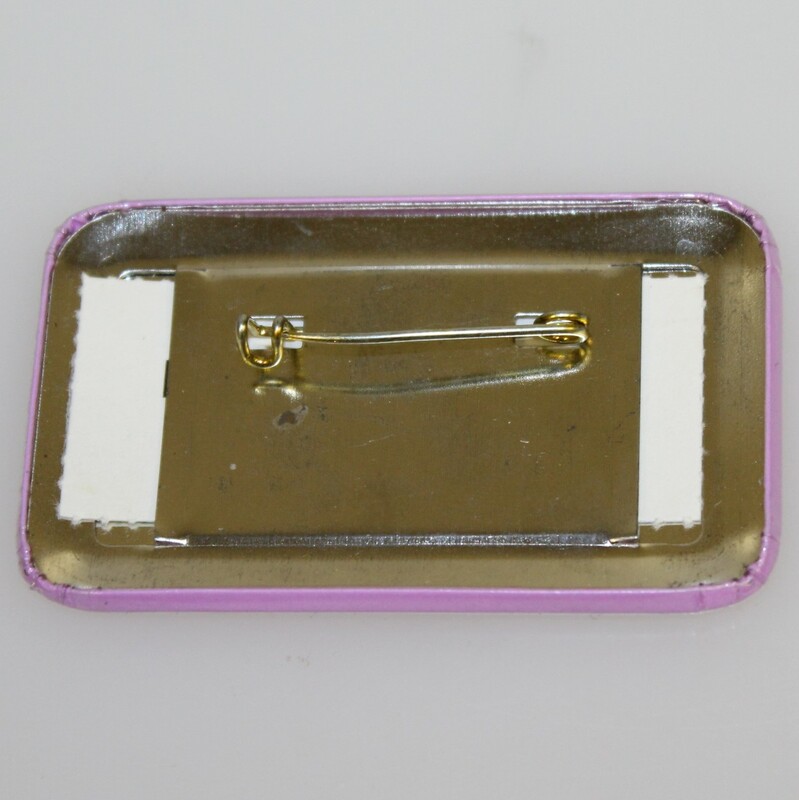 The badge is in good condition and the original pin is intact. José María Olazábal won his first green jacket in 1994 over Tom Lehman at the 1994 Masters Tournament. Ray Floyd's collection is the perfect highlight to The Golf Auction's 2018 Ryder Cup offering. It is easy to make that statement as some of Floyd's finest Hall of Fame career work came as a cornerstone of the United States Ryder Cup teams from the 1960's through the 70's, 80's, 90's and even his 2008 & 2014 appointments as a Vice Captain on the United States team were a testament to his experience, knowledge and dominance in golf's team sport environment. Yes, this individual could flat out play but that is only one part of winning at a team endeavor. Floyd also brought the intangibles to the team room. Over his career he was regarded as one of the game's greatest strategists. His course management and short game were second to none, he flat out knew how to help a team win. This and exceptional shot making led to 11 Ryder Cup appearances (8 as a player, 2 as a Vice Captain, and his 1989 Team Captain title). The number of Ryder Cup appearances may even have been higher if not for a 1960's PGA rule requiring a player to have five years on Tour before participating in the biennial matches. As a rookie in 1963, Floyd won the St. Petersburg Open in his 11th start, becoming, at age 20, one of the youngest winners in TOUR history. That was only the start of a run of success and longevity which would make his peers marvel. Floyd won PGA TOUR events in the 1960's, 1970's, 1980's and 1990's, joining Sam Snead as the only players to win titles in four different decades. In 1969, at the PGA Championship he won his first major championship. When he won the 1975 Kemper Open it was the start of a decade which saw Floyd's rise into the golfing elite. The 33-year-old Floyd played the 1976 Masters about as well as anyone in history, winning by eight strokes after starting with rounds of 65-66. His 70 on the final day of the tournament gave him a record-tying 271. Raymond loved playing from ahead and won some of his biggest tournaments that way. In 1982 Floyd opened the PGA Championship with a 7-under par 63 and led wire to wire for his third major. He also showed that he could win coming from behind when he captured his fourth and final major at the 1986 United States Open. It took an error free round of 66 on Sunday, scoring four birdies without a bogey on his card. Six years later, on the cusp of joining the Champions Tour at age 49, he won at Doral, in Miami shortly after a house fire burned the family home and claimed many of his early career mementos. Later in that same season, he won his first Champions Tour event, becoming the first player to win on both tours in a single season. At 50, he finished the year No. 14 in the PGA TOUR Official World Golf Ranking. At 51, Floyd played on the Ryder Cup team, the last of his eight appearances as a player. 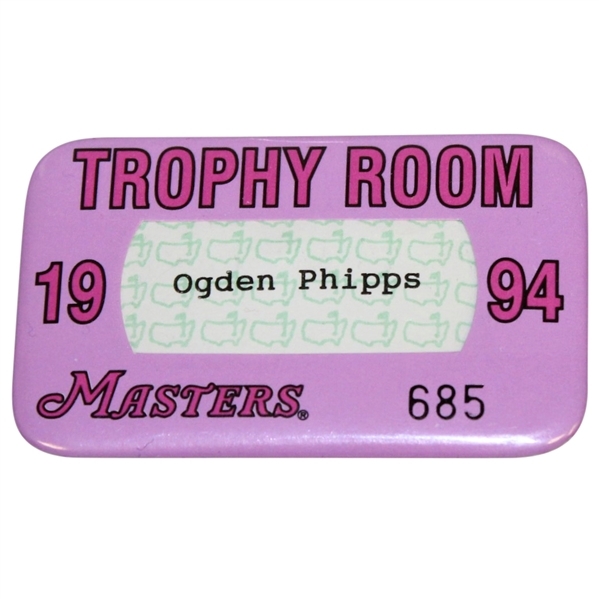 He would go on to thrive on the Champions Tour, winning 14 times there, including four senior Majors. 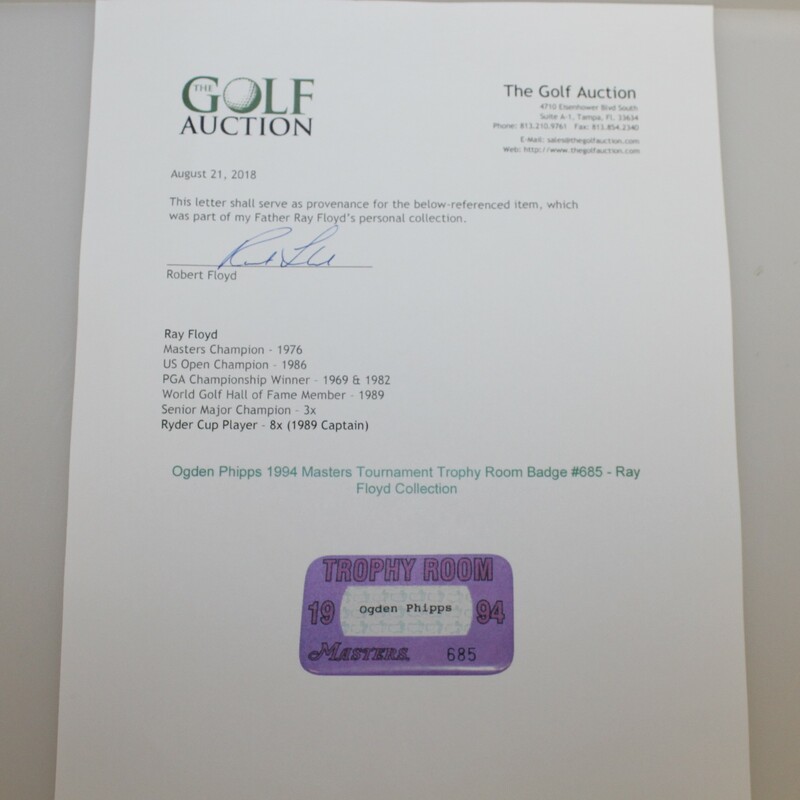 It is an honor to offer the golf collecting world some of the few personal items that have reached the public market from the career of Ray Floyd. The Golf Auction is proud to have a client in Robert Floyd which led to Ray Floyd agreeing to part with some of the prized items from his Hall of Fame career. It is even more special in light of the loss of many of Ray's early career mementos to a family home fire in 1992. It should be noted that Robert is an accomplished golfer in his own right. He was chosen by the American Junior Golf Association as co-player of the year for 1994, and was a semi-finalist in US Amateur. He paired with Dudley Hart to win the pro-am at the 1994 AT&T Pebble Beach National Pro-Am and became a two-time All-American at the University of Florida in 1996 and 1997. He played in 23 PGA Tour events from 1994 to 2009 making two cuts. In 2008, he was one shot out of the lead at Pebble Beach, but he shot 74-76 on the weekend to tie for 48th place and pick up $15,264 - his largest purse on the PGA Tour.